High temperatures and low humidity are not a new concept to us in California, in fact, it is a reason I live here. But in times when the temperatures become too high or the humidity too low, our grapes and the resulting wine are affected. Therefore, managing the temperature of the fruit zone to optimize ripening of the grape has been a hot topic (pun intended) in the industry. In recent years, we have been using shade cloth with great success to bring down the tempature of the fruit. Shade cloth filters the light and decreases the UV rays. It allows us to shade fruit evenly and control timing of leafing to create higher concentrations of phenols that give the wines rich and full flavor profiles. One thing that has been missing from the equation is the ability to not only lower the temperature but control it and add humidity. The use of spriklers and irrigation (common practice in the industry) to mitigate low humidity and high temperatures is like an old glove to a farmer, it feels good on but it doesn’t really protect you. In efforts to change conventional wisdom, Adelaida Vineyards began experimenting with foggers above the canopy (pictured below). The fogger simulates a light fog, enough to create a humid atmosphere but not enough to form droplets on the vine. This technology isn't new in winemaking and it is most commonly used in barrel rooms to keep wine from evaporating. This process uses minimal amounts of water to reduce vine stress and stop berries from overheating. This also allows vines to continue respiring and further the ripening process. Vines have microscopic pores called stomata and when under stress like wind and heat, they close their stomata to conserve water. Experience tells us to apply irrigation (water) before heat events to reduce the risk of damage. However with our cultivation methods done in the spring, we have preserved a reservoir of available water just one foot below the surface of the soil. Meaning the vines have sufficient water and canopy growth to endure these events but the fruit itself losses desired phenols and can produce cooked flavors that are not desired. 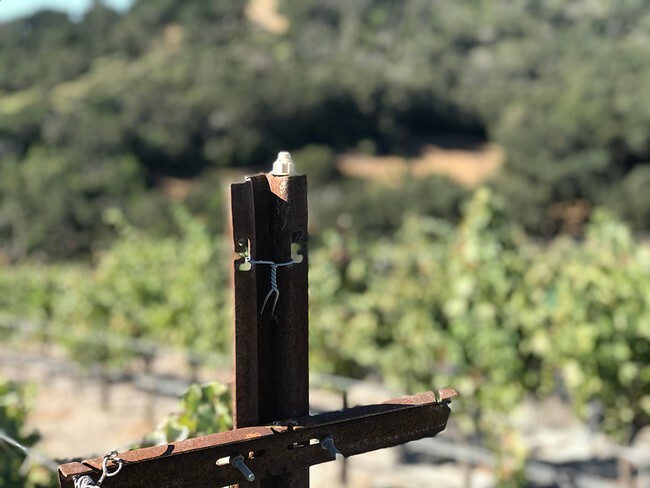 Our experiment is taking place on our high elevation Viking Vineyard where Cabernet Sauvignon is planted on thin limestone soils. High concentrations of limestone in soils can make very white, chalky soils and coupled with close proximity to the ground creates radiant heat that can have a negative effect during long and dry heat events. Our soil, adds beautiful lingering acidity to our grapes and fruit that need some “hang time”. The foggers allows us to do just that, it gives us control over high heat and low humidity events. 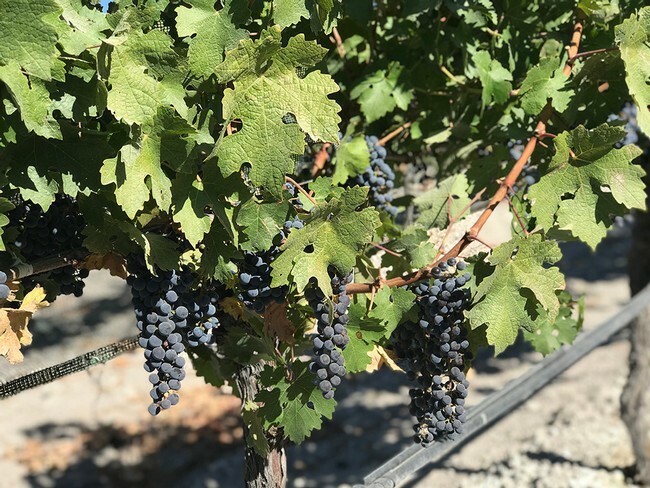 We believe this enables us to be more conservative with our water by never having our vines endure sustained and elevated temperatures post veraison. This is the first vintage with our fogger system and we hope to be able to share a success story with you next vintage. Viticulture is an ever changing and passion driven endeavor to create the very best we can with what we have at our feet. No doubt we will learn much from this experiment in an effort to always improve.